Washington, DC, July 12, 2012 The U.S. Chemical Safety Board (CSB) today released its 2012 2016 strategic plan. The plan is an update of the 2007 2012 CSB Strategic Plan, and includes the CSBs strategic goals, strategic objectives, and associated measures for managing and evaluating agency operations. CSB Chairperson Dr. Rafael Moure-Eraso said, The CSBs strategic plan contains 13 strategic objectives that enable the agency to work towards its mission of accident prevention. The plan builds on the agencys legislative mandate and includes an updated mission and vision statement. The strategic plan was approved unanimously by CSB board members and is now posted on the CSBs website and available at http://www.csb.gov. The CSBs updated strategic plan was developed by interviewing stakeholders in industry, academia, and other government agencies as well as considering public comment, which was submitted to the board for review. As a result the final version of the plan includes a CSB Most Wanted Program that will allow the CSB to focus on outreach initiatives surround key CSB recommendations. In addition, there are measurable objections and the final plan focuses on three main goals. Goal 1:Conduct incident investigations and safety studies concerning releases of hazardous chemical substances. Goal 2: Improve safety and environ- mental protection by ensuring that CSB recommendations are implemented and by broadly disseminating CSB findings through advocacy and outreach. Goal 3: Preserve the public trust by maintaining and improving organizational excellence. Goal 1 drives the core mission of the agency by ensuring that the CSB selects and completes incident investigations that have the potential to generate recommendations with high preventive impact. It also focuses the agency on developing and completing safety studies with an emphasis on emerging safety issues. Goal 2 focuses on implementing our recommendations and their associated advocacy and outreach. 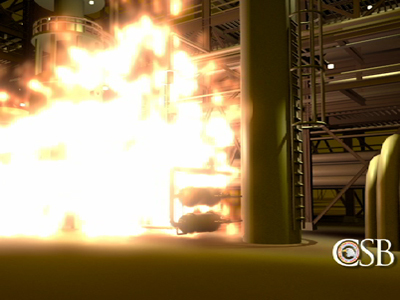 The highly successful CSB safety videos are an important component of the agency information dissemination efforts. Goal 3, on organizational excellence, serves to bind all agency processes using best practice project management. This includes all of the agencys high-performing administration and services functions.